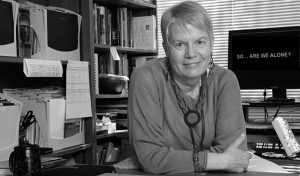 Jill Tarter has no trouble believing in the existence of extraterrestrial life, but after decades of research, she hasn’t been able to prove it. Tarter, a celebrated astronomer and founding member of the SETI Institute in Mountain View, California, will speak at 10:45 a.m. July 21 in the Amphitheater. SETI stands for “search for extraterrestrial intelligence,” and it’s been the central focus of Tarter’s career. She holds the Bernard M. Oliver Chair for SETI Research and has worked on large-scale scientific operations including SERENDIP (Search for Extraterrestrial Radio Emissions from Nearby Developed Intelligent Populations) and NASA’s SETI program High Resolution Microwave Survey, for which Congress cut funding in 1993. Tarter’s most recent large-scale project is the Allen Telescope Array, a “Large Number of Small Dishes” (LNSD) that work as a single instrument. The ATA currently uses 42 6-meter radio dishes, but the long-term goal is to build 350. “I’m hoping that the public interest will sustain that goal and this would become one of the world’s very best telescopes,” Tarter said. By constructing a large instrument using a number of smaller units, scientists can more economically and efficiently update their equipment to keep pace with the exponential rate of technological advancement, as opposed to investing astronomical sums (pun intended) in singularly customized instruments that are difficult and expensive to update. The ATA will also allow for data collection both day and night, seven days a week, accelerating the search process by a factor 100 or more. In a 2012 interview on NPR’s Fresh Air, Tarter explained that despite more than 50 years of research, SETI has only scratched the surface of its potential. She formally retired in 2012, but Tarter has in no way stopped working. She now devotes herself to securing private funding for the continuation of the ATA and other projects advancing the work of SETI.